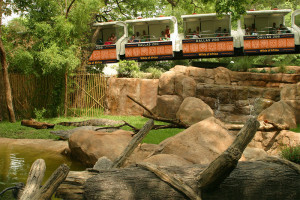 Editor’s note: Dallas Zoo keepers are fully responsible for their animals, from their health to their habitats. This two-part series explores how some keepers care for the areas that are home to our residents. 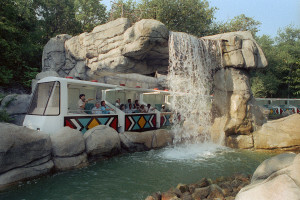 Part Two: The gorilla habitat. Preparation of the gorilla habitat also begins early every morning, and includes an extra task: Anyone entering the building must don boots, and visitors also must wear rubber gloves and a mask, so no illnesses are passed to the gorillas, or vice versa. Gorillas can catch nearly any ailment that humans can, even the common cold! Today the primary caretakers responsible for the care of the gorilla habitats are Cindy McCaleb, Primate Keeper, and Sarah Villarreal, Primate Supervisor, both of whom are very familiar with the eight Western lowland gorillas. Inside the building, one of the volunteers prepares vitamin sandwiches. McCaleb heads out to walk the South habitat, cleaning and checking every corner for branches hanging into the exhibit, toxic plants, or food or trash that may have blown in. She points out squash and tomato plants that have begun growing out of dropped seeds from the gorilla food. Soon, these plants will start bearing fruit, and the gorillas will find a nice treat. 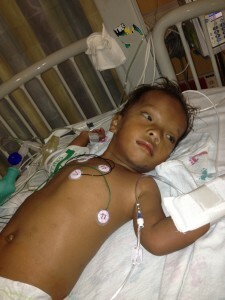 After the initial cleaning is complete, McCaleb circles back and dispenses food. The gorillas’ diet ranges from primate chow to many kinds of fruits and vegetables – these smart animals need a lot of diversity so they don’t tire of any one food. Today’s treat is corn on the cob, hidden away so the gorillas will have fun finding it. After Cindy finishes both sides of the gorilla habitat, she returns to the kitchen. “The busiest time comes first thing in the morning,” she says. First, the keepers say good morning and do a visual check of all three females (Megan, Madge and Shanta) and five males (Zola, Shana, B’wenzi, Juba and Subira). The keepers look carefully for any abnormalities on the bodies of the animals, who range in weight from 175 pounds (Megan) to 430 pounds (B’wenzi). “That’s where the medical aspect comes in,” McCaleb says. “You have to recognize the signs and know what’s normal and what isn’t.” This is crucial to keeping the gorillas healthy. 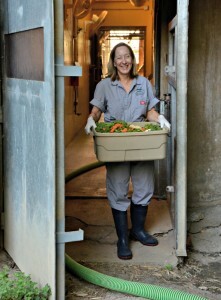 One keeper prepares juice and grapes to be used in training sessions, while another begins cleaning the habitats. 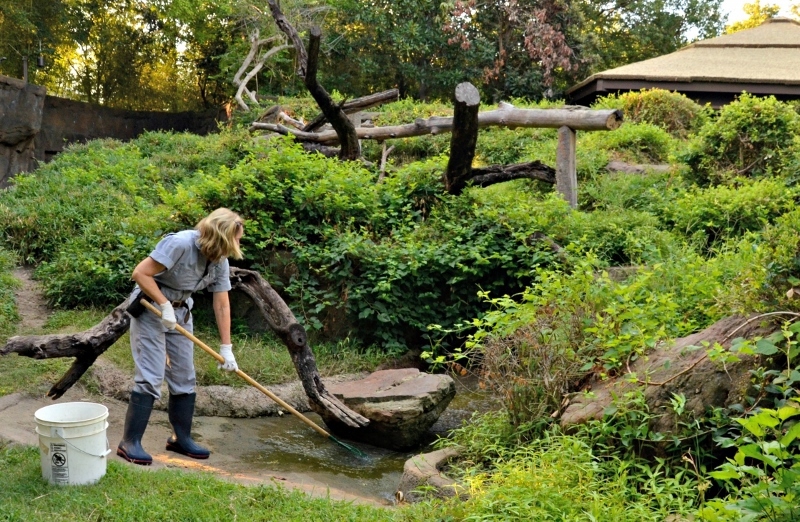 The gorilla exhibit totals two acres, and sometimes one keeper must clean it all. After finishing, though, another keeper checks it for the safety of staff and animals. 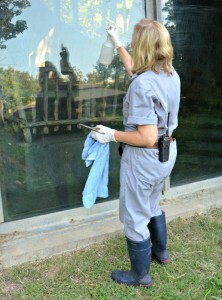 As with the big cats, the gorilla keepers also perform a detailed perimeter check. The keepers have a training session with the females and Subira to teach behaviors, such as “open mouth” to check their teeth and “full body checks” for medical management. Then they’re released into their habitat. The males have their own training session, presenting body parts so keepers can check for injuries or abnormalities, and may sometimes be taught a new behavior. For instance, the keepers have been preparing the gorillas for a cardiac ultrasound, so training includes getting them used to a plastic wand similar in size and feel to the one used in ultrasounds. Because gorillas are more communicative through body language than vocalizations, the keepers will point to the area they want the gorillas to present, in addition to saying it aloud. After training, the males head into their habitat. But the keepers aren’t done: they quickly start cleaning the inside of the night quarters and prepare food for the next day. They also check the enrichment schedule and set out enrichment items for the gorillas to investigate overnight. These enrichment items vary, from barrels that dole out small amounts of food when rolled around to raisin boards that act as a sort of puzzle for the gorillas to solve. When the animals come in for the night, they start playing with the enrichment toys immediately. McCaleb has even found them with the barrels on their heads! The gorillas move around freely in their wooded habitat, designed with moats and secluded areas, which is why they may be harder for the public to spot. “We want to let the gorillas feel they have some sort of control, and they have the choice to move away,” McCaleb says. Taking care of animals is a constant job — lions, cheetahs and gorillas don’t celebrate Christmas or Thanksgiving. Every day, no matter what the weather is or if it’s a holiday, keepers feed and care for their animals. 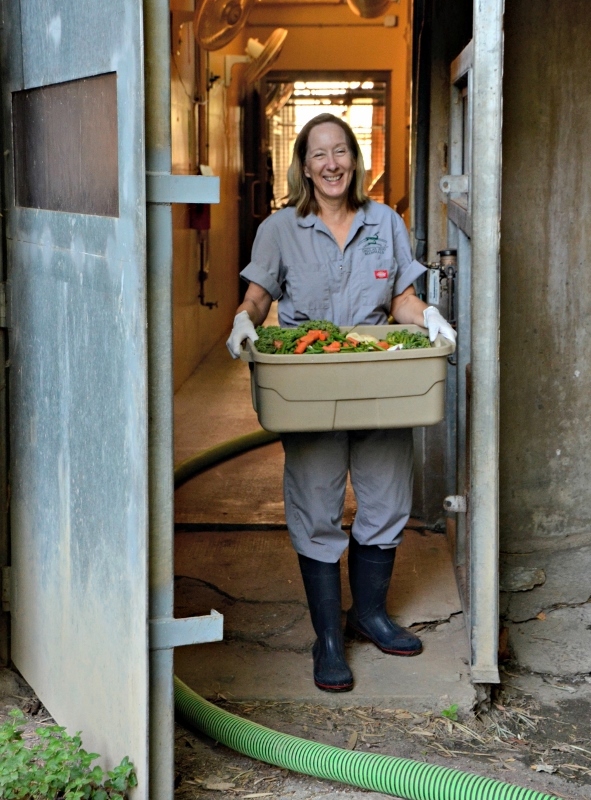 “We’re here every day, no matter what,” says carnivore keeper Becky Wolf. A lot of science and research goes into their jobs; keepers at the Dallas Zoo have graduated from college, with degrees varying from biology to zoology to animal studies, even psychology. (McCaleb’s major was social work; she says it helps greatly in identifying animal behavior). Keepers regularly work on projects that involve studying and research. Keeper Sara Squires began volunteering at the Denver Zoo at age 18 and has been a keeper of hoofstock, hogs, and now lions and cheetahs. 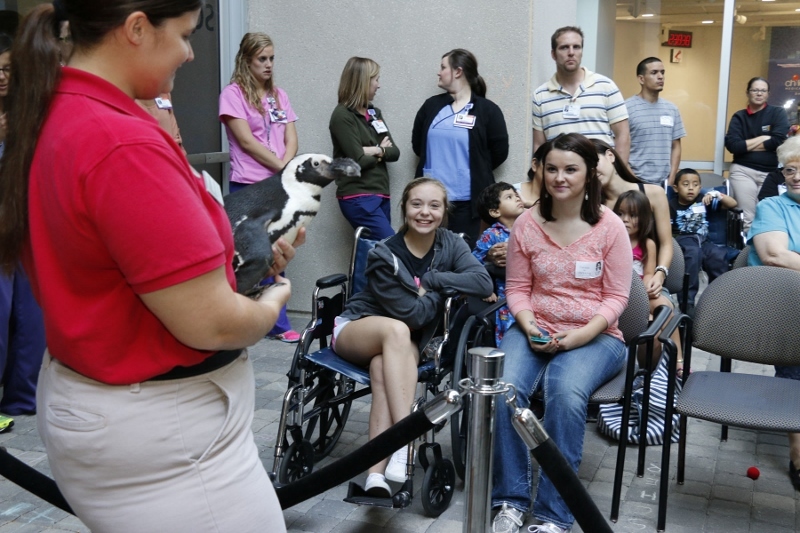 She hopes to one day become a behaviorist, which would allow her to still have close contact with the animals. 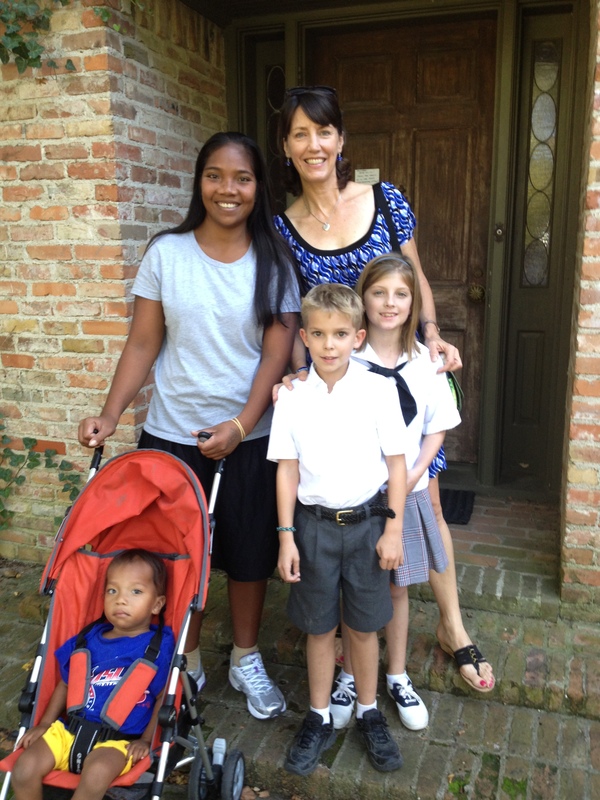 McCaleb first became interested in gorillas as a child when she saw noted researcher Jane Goodall on television, eventually hearing Goodall speak at her school. 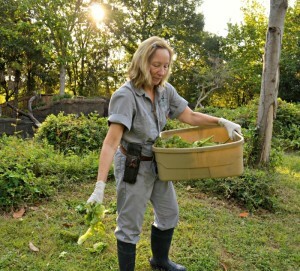 She began working at the zoo 15 years ago as a research volunteer, then moved to the animal hospital, then to birds, eventually working her way to gorillas. It’s a tough job, but a rewarding one. Reptile and amphibian supervisor Bradley Lawrence guest-blogs on taking care of our diverse collection during hibernation months. 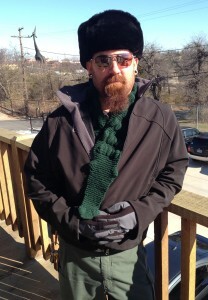 Another North Texas winter is in full frigid effect — which means I layer on my warmest clothes, boots, gloves, scarves and – yes – my big, fluffy hat to keep warm. 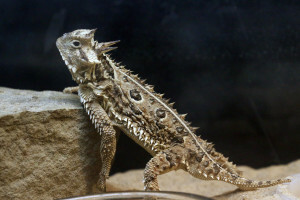 But for our reptiles and amphibians, when the temperatures drop, so do their body temperature, heart rate and digestion. In the wild, these guys would need to find a temporary home underground or in a sheltered area where they can protect themselves and go into hibernation. Here at the Zoo, even though our reptiles and amphibians are in climate-controlled homes, we still need to take them through the motions of winter. Seasonal changes like temperature and rainfall are crucial cues to let them know when it’s time to reproduce. Amphibians typically will lay eggs during rain events. This ensures that the eggs and tadpoles will have enough water to last through metamorphosis. Many temperate reptiles will take advantage of warm months to feed while resources are abundant, then go through a period of hibernation through the winter months. Some reptiles will breed prior to hibernation, then gestate through winter and lay eggs or give birth in the spring. Some reptiles will breed in the spring following hibernation. 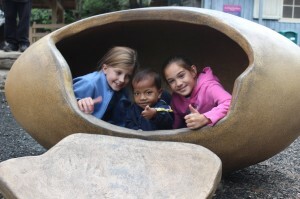 At the Zoo, we have a “hibernaculum” that we use to house and carefully control the winter temperatures for those temperate animals that need a period of hibernation. We start by gradually lowering the temperature of the animal’s enclosure and reducing the amount of food they receive. Reptiles generally need warm weather to digest food properly. Once they have reached a low temperature, they’re taken off of food to let their bodies completely digest and process the food already in their system. Then, after a veterinary exam to ensure they are healthy enough to hibernate, they are placed in the “hibernaculum.” Here, the temperature for some of our snakes can be taken down to as low as 45 degrees. 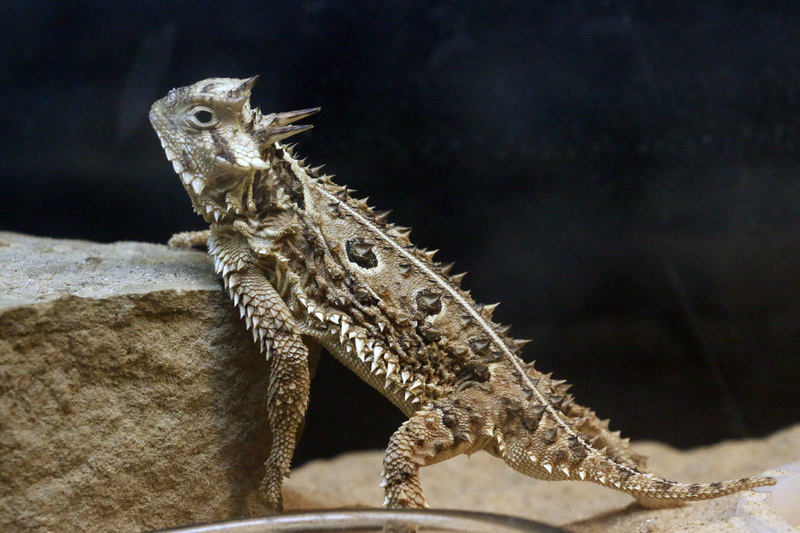 The Texas horned lizard, a very high-profile lizard in our collection, is one reptile that requires a period of hibernation in order to reproduce. They are all in the hibernaculum now at about 49 degrees. We’ll slowly raise the temps in March to bring them out of hibernation. Then the males and females will be put together for breeding, helping to ensure the survival of this iconic Texas species.